Amazon, as of yesterday, is listing Tom Brady vs. the NFL: The Case for Football’s Greatest Quarterback as in stock. I’m hopeful other online retailers will follow suit presently and that it’ll show up on store shelves over the next few days. (Barnes & Noble has books, so, you know, it’s just a matter of letting consumers at them.) Stay tuned. Or follow the link on the TBvNFL page linked above to order from Amazon now. I’ll be joining Patriots Goal 2 Go on Wednesday, August 1 (rabbit, rabbit) to talk about the Pats and Tom Brady vs. the NFL: The Case for Football’s Greatest Quarterback. The show gets going at 9 p.m. I should be on around 9:15. Give a listen. Had a great time talking quarterbacks with the guys from Gridiron Chefs yesterday afternoon. They asked a ton of great questions, and I managed to offer at least one, maybe two, semi-competent responses. If you’re interested in hearing the show (and, you know, the interview with yours truly) for yourself, you can do it right here. 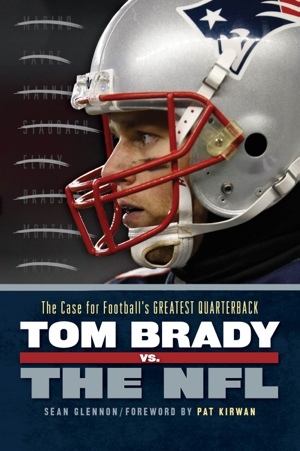 I’ve just been informed by the folks at IPG (which now distributes Triumph Books) that, Tom Brady vs. the NFL: The Case for Football’s Greatest Quarterback has a ship date of August 24. What that means to you and me is that the book will be showing up in stores much sooner than October 1. Through both both Amazon and Barnes & Noble are still listing a publishing date of October 1 (and still displaying a very early draft of the cover that looks nothing like the final), the book should be available almost everywhere by the start of the NFL season. So, you know, that’s pretty exciting. Or at least you’d think so if you were me, which you’re not. (Don’t get all broken up about that. You’re almost certainly better off being you. Unless you always wanted to be the person to write this book, in which case I say hard cheese. Even though no one says hard cheese. Almost hardly never.) And maybe you think so even if you’re not me, because you love your Patriots, or you think Tom Brady‘s the bee’s knees, or, you know, whatever it is you’re after that makes this book appealing to you. I feel like I should reiterate, because it’s still true (hopefully it’ll change soon) that there is some inaccurate information in the descriptions of Tom Brady vs. the NFL on Amazon and Barnes & Noble.com. There are no sidebars about Brady’s hair, Brady’s wife or Brady’s fashion sense in the book. Items on some of the top quarterbacks currently playing in the NFL — Aaron Rodgers, Drew Brees, Ben Roethlisberger, and Eli Manning — along with analysis of how each stacks up/may stack up with Brady. The book also includes a foreword written by Pat Kirwan, senior analyst for NFL.com, co-host of SiriusXM NFL Radio’s Movin’ the Chains, and author of the truly great football book Take Your Eye Off the Ball: How to Watch Football by Knowing Where to Look. If you haven’t read Pat’s book yet, you really, really, really ought to; it’ll make you a better football fan. Pat’s an editorial consultant to The NFL Today on CBS. He’s also a longtime coach and front office guy. All of which is to say Pat’s been around football for a long time in a lot of ways. He’s someone whose opinions on football I hold in incredibly high regard. You should, too. And if you do, you’ll be interested to read what Pat has to say about Brady and his place in NFL history. The guys from PatsFans.com were kind enough to invite me to join them on their BlogTalkRadio show PatriotsFourthAndTwo yesterday evening. Had a great time. We talked about expectations for the 2012 Patriots, Tom Brady‘s future, Game Changers: The Greatest Plays in New England Patriots History and, of course, Tom Brady vs. the NFL: The Case for Football’s Greatest Quarterback. If you’re inclined to listen, it’s right here (I come in at about 24:45, but I’d recommend listening to the whole thing). 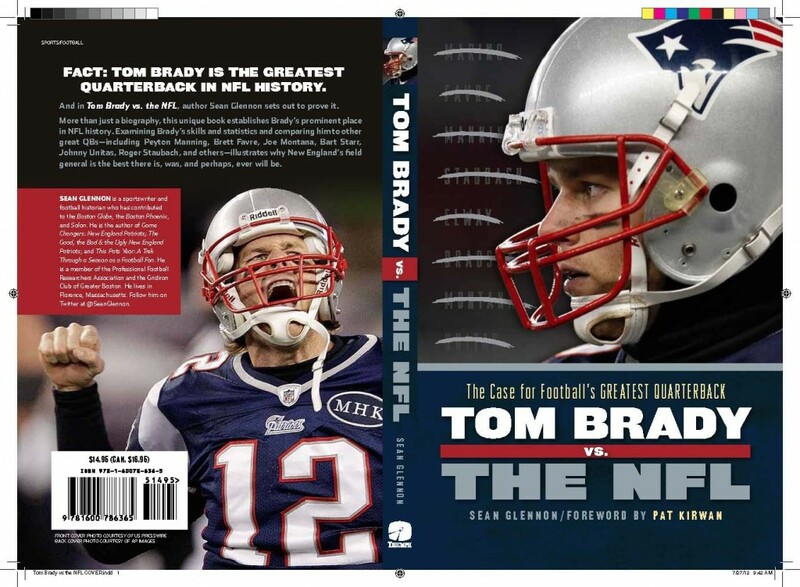 My new book, Tom Brady vs. the NFL: The Case for Football’s Greatest Quarterback, is now available for pre-order on line. I’m sure you can get it from whatever your favorite internet book retailer may be, but I know it’s available from both Amazon and Barnes & Noble. Some of the information in the description on those two sites is inaccurate. There are no sidebars about Brady’s hair, Brady’s wife or Brady’s fashion sense in the book. That was part of the original plan, but the book worked out to be a pretty serious football book. The tone isn’t all serious, mind you; I think this book is a lot of fun to read. It’s just that it turned out that it needed to be a book about a football player rather than a book about a celebrity athlete. The off-field stuff just didn’t fit. Chapters on 15 of the NFL’s greatest quarterbacks/passers including Sammy Baugh, Otto Graham, Johnny Unitas, Bart Starr, Roger Staubach, Joe Montana, Dan Marino and Peyton Manning; each paired with a side-by-side career comparison with Brady. The book also includes a foreword written by Pat Kirwan, who you know as senior analyst for NFL.com, co-host of SiriusXM NFL Radio’s Movin’ the Chains, and author of the amazing book Take Your Eye Off the Ball: How to Watch Football by Knowing Where to Look. Pat’s also an editorial consultant to The NFL Today on CBS, and a longtime coach and front office guy, who most recently served as director of player administration for the New York Jets. Pat’s one of a handful of guys whose opinions on football I regard as approaching gospel. He knows the game. And he knows quarterbacks. So I was really honored when he agreed to write the foreword for this book. He has some interesting things to say about Brady. His foreword’s worth a read all by itself. The book is currently scheduled to hit stores October 1, though I know it’s currently ahead of schedule in production. That’s probably enough for the nonce. More as fall approaches. As of yesterday, my new book is officially written. It’s in Triumph’s hands now and is scheduled for release in the fall, to correspond with football season. I’m not going to say much about it right now, but I will say that it includes reviews of the careers of sixteen NFL quarterbacks, fourteen of them retired/historical and two active, along with sections on four other current QBs, with a main focus on one current player. The scope of the book is fairly extensive. It covers seven and a half decades of NFL history, going all the way back to the emergence of the league’s first great passer, Slingin’ Sammy Baugh. More to come soon enough. On Wednesday, September 28, I’ll be discussing the Patriots and reading from Game Changers: The Greatest Plays In New England Patriots History at the Tewksbury Public Library. The event, which runs from 6:30 to 8 p.m., is free and open to the public. I’ll have books to sign and sell at the tail end of the evening. You can get more information, and register to attend, here. I’ll hope to see some of you there.